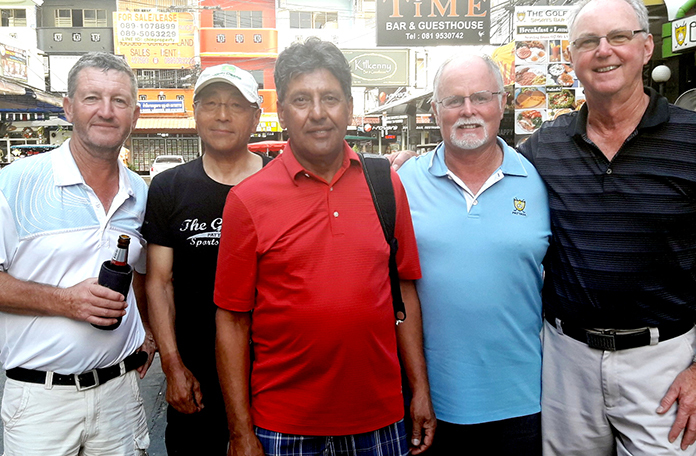 From left: Gary Emmett, Masao Ishikawa, Bahadur Lidder, Dave Johl and Blake Hanna. Yes, there are many changes happening here at Rayong Green Valley but a little birdy told me there is no planned closure as of yet. 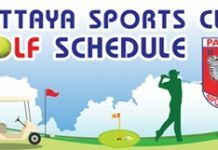 Golf in Pattaya has so many rumours flying but as of this writing, RGV will stay open through the summer. Speaking of closures, has anybody heard why the Rayong C.C. is closed? Did they find a sugar daddy to do what Chang Breweries did to Pattavia Century? We sure hope so as this area needs another golf course as bad as Soi L.K. Metro needs another Go-Go bar! Loads of great scores out there today, it must have been the perfect weather we have been having of late. The postman only rang once and 37 points were just enough to get Dave Ferris up on the podium. Ishi is back with a vengeance and 38 was his fine total. Tied at 39, Stefan and Peter had to share second place today whilst visiting Vancouverite David Johl tore up the back-nine to tally a big 40 on the scorecard for the win. Apologies to Fred Birch, how could I possibly forget his amazing 47 point round two weeks ago! Capt. Phil took down the sign-up sheet early for this course as our 7 tee times were fully booked. Cheap and cheerful is how we would describe the Navy course but surprisingly there are some of the best laid out holes in Pattaya here. That pretty par-3 Lighthouse hole is one that is the envy of every golf course owner in Pattaya. This golf course boasts of elevation changes and some of the tee shots here are comparable to Soi Dao without the 3-hour drive. Condition of the course is marginal, but we can forgive those trespasses for the cost, accessibility and beauty of the layout. If I may suggest those bunkers could be raked every few weeks please? It just goes to show that you do not necessarily need a big name golf course architect to plan out a lovely design. Did you know that this is one of the oldest courses in the area and started life as a mere 9-hole track? David Johl won again today, even after being cut a stroke and our old pal Pete Hynard took second with a nifty 37, proving there is still life in the old dog yet. Not only that, but Pete claimed the Caddy Smile near pin as well. Just one shot back was a three-way tie for third at that 36 point mark. Bud, Wayne and Kenny all shot to their handicap for a little kick back from Capt. Phil. If you follow my ramblings at all you will know that I am a huge fan of this golf course. We have supported the efforts and investment here since the get-go and Pattavia Century has never let us down. It even has been chosen to host the final singles round of the Mulberry Ryder Cup for 2017 on February 9 – so watch this space for results! We were off the white tees today and at 6,639 yards it was a tough old slog. That being said, there were some very good scores turned in! Blake Hanna found his form on at least one hole and that resulted in a comfortable tap-in par to win the Caddy Smile near pin contest. Bahadur Lidder turned in 37 points for the fourth place while our visiting buddy back from Japan, Masao “Ishi” Ishikawa, had a terrific 38 out there, which anyone would be happy with at Pattavia. Ishi tied with the postman Dave Ferris for second. Nobody could touch Gary Emmett, and with a 40 pointer out at Pattavia it was a well-earned win for our Aussie mate. As the cliché goes, the Emerald is a real gem of a golf course. It is hard not to like this track and the relatively easy first couple of holes creates the impression that it will be a push-over and a 40 point round is on the cards. I do like a course that lets you get a few holes in to warm up, but don’t be fooled, there is a beast behind this beauty. Like the Navy course and Pattavia that we played earlier this week, this is a modest golf course with a humble little clubhouse. What all 3 of these courses share is the playability, pricing and the enjoyment factor. It must have been hard work out there, judging from the scoring. Not one golfer shot to their handicap, and Mark Wood took third place with only a 33 on the card. Andy Leach could only muster a 34, and the winner got away with 35 stableford points. That is a low number for Alan Rothwell who had his best round in Thailand last week!